Shifting transports from road to rail is an ecological necessity, and there is widespread political support for that goal. Still, the modal share of rail in German freight transport remains below 20 percent. 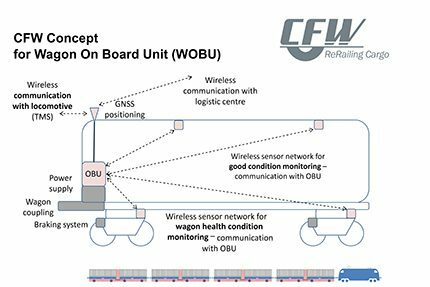 One reason is that freight wagons have not seen significant progress for decades. In contrast, road transport has achieved considerable performance improvements: Fast door to door transport, high flexibility and continuous monitoring of transport vehicles and their cargo at affordable costs are taken for granted today. This does not even include further progress through autonomous driving and platooning (i.e multiple vehicles driving with very little space between them thanks to a steering system). Thanks to these features, the wagon is not only fast and economically efficient, but it also causes significantly less noise than the models available today. The CFW initiative comprises industrial companies (Scheidt & Bachmann System Technik, Contitech) as well as rail and logistics experts (ConTraffic, TransCare) and research centers (German Aerospace Center, CEIT, Institute of Lightweight Engineering and Polymer Technology at Dresden University of Technology). 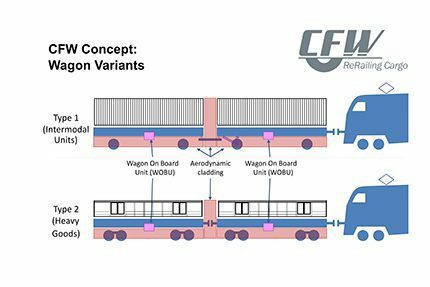 As one of the biggest European freight wagon rental companies, Ermewa is going to join CFW. Ermewa’s precise feature requests and opportunities for showcase operation will support the breakthrough of the needed revolution. Is Europe stuck in the slow lane? This entry was posted in Equipment & Technology, Features, Logistics, News. You can post a comment.